Rescale just added NVIDIA’s most advanced GPU yet, the Tesla P100, to the ScaleX big compute platform. Beginning today (September 13, 2017), all platform users are able to select the P100s as part of our standard batch workflow. NVIDIA’s announced next-generation architecture, Volta, will be available early 2018 on Rescale. To allow Rescale users to take advantage of the new P100 core types, GPU-accelerated simulation software applications Sim4Life is available and pre-configured to run with flexible, on-demand licensing on Rescale’s big compute platform with ANSYS Mechanical, ANSYS HFSS, ANSYS Fluent and Abaqus 2017 Standard becoming available shortly after. Users can also use their own existing licenses on the new P100 GPUs on Rescale. To get you started running NVIDIA P100s today, below are a couple sample jobs you can clone and run to test our new hardware. For instructions on how to clone a job, click here. You will of course need a Rescale account to do so—you can sign up for one here. TensorFlow is known for providing high-performance model training. 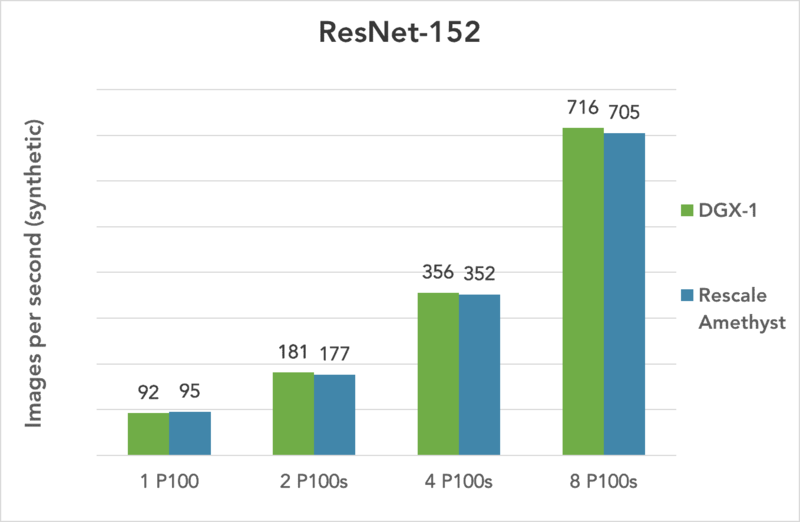 Here are some benchmark results comparing Rescale’s NVLinked P100 system with the high-performance DGX-1 deep learning server. We see that Rescale can achieve comparable performance to high-end on-premise GPU servers. Click here to clone the InceptionV3 4xP100 job. The link below is an example of training a Deep Convolutional Generative Adversarial Network (DCGAN), which generates realistic fake images that are similar to the input training images. This example is trained using Rescale’s NVLinked P100 systems on the LSUN bedroom image dataset. Click here to clone the PyTorch DCGAN job. In conjunction with the P100 general availability, we are launching the Deep Learning Kickstart Program, which will provide $1,000-5,000 in Rescale hardware credits for P100 use to approved applicants. All Rescale users representing a company will be eligible to apply after attending a kickoff webinar that will give additional details on Rescale’s Deep Learning Kickstart Program and demonstrate how to use the NVIDIA P100s to accelerate deep learning on the cloud. The webinar will be held on September 21, 2017 at 8:00 am PDT / 11:00 am EDT.